The Pentagon may announce as soon as this weekend a plan to bring up to 400,000 furloughed civilian employees back to work, according to two Defense Department officials. CNN has learned the plan is in the final stages of being written and approved. If all are returned to work, it would represent about half the number of government civilian and contract employees at risk of furloughs during the government shutdown that began on Tuesday. The partisan congressional stalemate over spending for the current fiscal year shows no sign of ending anytime soon. Details of the Pentagon plan were being worked out on exactly which employees would be brought back and how they would be notified. The officials declined to be identified because the plan has not yet been announced. But Defense Secretary Chuck Hagel made his view clear while traveling in Japan. "We were forced by law to furlough many, many of our civilian workers. But we're trying to find a solid legal interpretation here in the law that can bring back more people in support of our military," he said. 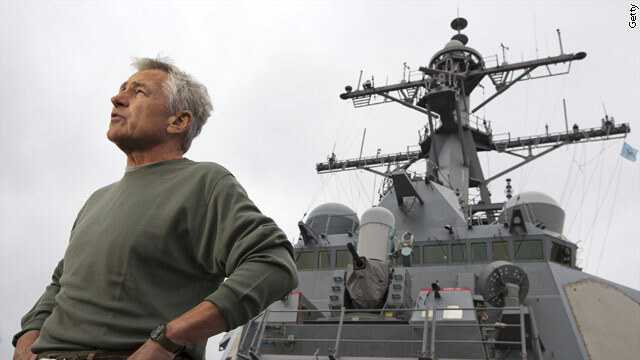 It's expected the Defense Department will issue a broad statement from Hagel saying he is authorizing employees back to work followed by detailed memos about the recall would work. Obama administration lawyers have been working to interpret how much leeway they were given by Congress over personnel in a measure approved just before the shutdown took effect that ensured troops would continue to be paid during a government closure. Language in the law said civilian personnel and contractors will be paid if the secretary of defense "determines" they are providing "support" for the troops and several members of Congress have said that gives Hagel broad authority. But the two officials said lawyers were still working on what that means because the law does not specifically say all employees can come back. "The question is who works here at the department who supports troops?" one official said. There will have to be some legal finding as to what jobs and which personnel specifically support troops, both officials said. But Defense Department officials are well aware that Hagel is pressuring to bring everyone back to work next week. "There's no job in our Department of Defense that doesn't support the military. So, I think theoretically - I'm not a lawyer, but I do have some appreciation for common sense, and common sense tells you that if you're working for the Department of Defense, you're supporting the defense and the security of America, and you're supporting those who are on the front lines," Hagel said. Hopefully rescreen is people correctly the way the country is leaking information currently is really sad . I hope the Pentagon knows what they're doing. Forgive me for this but I don't care if government workers are furloughed. Did they care when I was laid off? Did they think that maybe I might think my job was just as important as theirs? They are nothing but over paid, under worked idiots half of them. But they are part of the federal workers union right? Oh, yes, the federal workers union. What the F is up with that anyway. How can they even have the right to unionize? Good God. I could care less if the government stays shut down, this is one thing that definitely won't affect me and that's good. Hope they all feel the pain that the private sector people fet that got laid off due to Obbumbles bad policies and bad leadership. And why not make HIM take a nice long furlough too. That would make my day. Huh? The Pentagon is the very reason why the government should STAY shut down. The biggest frickin money sucking part of our whole USA. They are just way, way too big and so is our military. But hey, let's keep building those cyborgs. And why should any furloughed worker get back pay? Why are they any more special than any other US citizen that gets laid off? It's a bunch of b.s. if you ask me. I like certain aspects to our government but I do firmly believe we can be a highly efficient developed nation without such a huge government. And I am a little fed up with being a damn general obligation that's backing the full faith and credit of all the GO bonds our country issues. Someone has to bring Hagel his coffee! This is an essential employee! pentagon is a joke 1 nuclear icbm and usa england ireland will burn into ashes in 1 second usa has inferior technology so usa and britain has already lost the war. COMPLAINTS TO CHILDREN OF POLITICAL, JUDGES AND PROSECUTORS NORTH AMERICAN EUROPEAN AND ASIAN. It doesn't matter what you do. Faith in the USA at home and abroad is taking a hit. There are millions of people whos jobs depend on this stuff working. From the guys who assemble our jets, to the people who handle healthcare, this shutdown has already trickled down. People have been and are being laid off in mass numbers. Nothing you can do now will help them. It is too late . We might as well default because this screwed the country up enough people will be feeling the effects of this for years. Not the rich as holes who are causing it , but the common people. Taxes this year are not mandatory right? You don't do your jobs why should we do our part. Fund everything , or fund nothing. Lets watch our great country burn to the ground, that is the republican way right? Here's just more evidence that we have the wrong priorities and have had since the 1950's during the cold war. The military has had top priority over everything else and now we're all paying for it. This sorely needs to change and fast!!! Many of the civilians in the Pentagon act in support of the troops. But, then there are a slew that don't support the troops. They support the bureaucracy. If your job can be traced directly to a warfighter, you should come back under this law. If you are part of the "bureaucrat army" that does nothing more than push paper and make Powerpoint decks, you should stay home as part of the shutdown and get no special treatment. If you've ever worked in Washington or at a major military support command you'd know that the civilian ""bureaucracy" are the folks that do most of the work and advise the command's military personnel who have limited experience in their position and only serve a two year tour before moving on to another command. I work in Washington, as a civilian defense employee, in the most major command there is: The Pentagon. Since I *DO* work there, I know that the civilian "bureaucracy" are the folks that do relatively little of the work and sit in their cush little it's-harder-to-fire-me-than-tolerate-me jobs-for-life. They are there to put stacks and stacks of rules on the warfighter and rules for making rules and rules for reviewing rules and rules to determine when we need more rules. It's rare we reduce rules because that would threaten our bureaucracy and we'd break our cush little jobs because someone might be able to do something without having to tow 18 tons of rules behind them. Go look at the FAR and then the DFAR on top of that. Go look at the travel regulations! We civilians are - as a group - an impediment to the warfighter, and they're probably getting more done in a week without the bureaucrats than they'd get in a month with them. I do server at a command. Daily. At HQ. For the top org in HQ. So, you can jam your arrogant judgement up your tailpipe. Most civilians are not doing any direct support for a warfighter and are, therefore, not eligible to return before the shutdown ends. The SecDef's interpretation is - at best - flawed. Most of the civilians are paper-pushers and Powerpoint deck creators or other useless functionaries that have limited value. The DoD is a backwards relic when it comes to the business mission area and it's mostly because of people who blindly make and follow rules (rules that are not-infrequently set up to protect one's turf). It's the rules that prevent us from adopting management styles, project design and technology that the private sector has had for years. Anticipating your question about why I'm there then: I was *recruited* from the private sector as a term appointee because of my distaste for too many rules in the hopes that I could help make things in my problem domain easier to implement by ripping through the bureaucracy. See, I took a pay cut to serve as a DoD civilian. And I had no fear of them firing me so I'd slice across their rules to get actual work done. If they wanted to fire me...oh no...I'd have to go back out to the private sector and a big pay raise. When my term was up, I was begged to apply for the permanent version of my own job. I felt I owe some more service. I won it and I go to work every day, cutting through rules like a weedwhacker, showing others that subjective implementation of the mission is more important than blindly following some rule written by someone who didn't anticipate the problem we're solving...someone who probably couldn't understand the problem we're solving. So, Tony: know what you're talking about before you make statements that are absurd. It pains me to state the obvious, but how much daylight is there between the tea bag republican shutdown, and terrorists, when both aim to hurt the economy to get their way? Boehner only need to hold a vote on a clean CR. As Speaker, he is one of the key custodians of democracy, but his methods should put him and the house tea bags on the 'watch list'. Reid also could have averted the shutdown by voting on the House's final compromise bill. 1. Congressmen and their staffers had to give up the $5000-$11,000 subsidy they'd each get to buy a health care plan. 2. The IRS would have to wait a year before penalizing people who can't afford any health care. The president has already given 18 other delays and moratoriums through regulation, congressional cooperation or executive order. So, this would make 19. Do you have a problem with either of those so much you think the government should close over it? Reid and the Senate do! The had (and still have) a house bill with a CA as long as the congressmen fat cats give up their health care subsidies and the IRS waits a year to start nailing people. Is it a "clean CR". Not by the definition above. But, it's a VERY small price to pay to keep the government open. And the Senate declared it DOA. Because they want the shutdown. Because they think they can blame the GOP for it in next year's elections. The government could have never shut down...but Reid has a "no negotiation" rule that shut us down. Because they won't accept some basic, easy amendments. "We were forced by law to furlough many, many of our civilian workers. But we're trying to find a solid legal interpretation here in the law that can bring back more people in support of our military,"
Pay Our Military Act – Appropriates for FY2014, out of any money in the Treasury not otherwise appropriated, for any period during which interim or full-year appropriations for FY2014 are not in effect, such sums as are necessary to provide pay and allowances to: (1) members of the Armed Forces, including reserve components, who perform active service during such period; and (2) civilian personnel and contractors of the Department of Defense (DOD) (and the Department of Homeland Security [DHS] in the case of the Coast Guard) whom the Secretary concerned determines are providing support to such members of the Armed Forces. Second paragraph starts with REQUIRES the money be made available! The law basically says the furlough should never have happened. However, with over 450,000 DoD civilians furloughed the DoD saved over $1B. Of course now congress is making the DoD give back pay to all furloughed DoD employees...so the DoD doesn't get to save all the money they thought they would. There are a lot of furloughed civilian and contractor folks who really support the military. They buy the the soldiers' food, overhaul their aircraft, fix their tanks, buy their munitions, teach their children and on and on and on. Remember, those men and women on active duty today are more dependent on the civilians "back home" than ever before. It started before Bush and continues today, the concept that; wherever possible, civilians or local contractors would be hired for the non-combat support jobs. By letting the military 'man' fight and not be responsible for "peeling potatoes" is a concept well founded in military strategy. Well, these supporting personnel are the men and women now furloughed.